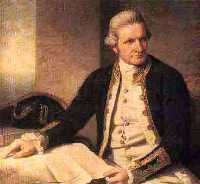 European discovery of Australia by Lieutenant James Cook. Captain James Cook. Mapping of the east coast of the great south land (Terra australis), after observing the 1769 transit of Venus in Tahiti. In June 1769, having safely completed his primary scientific assignment to observe a transit of the planet Venus across the face of the sun from Tahiti in the South Pacific, Lieutenant James Cook and his crew, sailing in the bark "Endeavour" continued westward. After earlier cultural misunderstandings, and for the most part avoiding hostile Maori reception parties when landing to replenish supplies, Cook and his crew spent six months circumnavigating and mapping the coastline of New Zealand, before he finally opened his secret orders. Their new mission was to find the undiscovered southern land, Terra Australias Incognita, which many Renaissance geographers believed had to exist to counterbalance the northern continents. Given orders to navigate as far as south as the fortieth parallel in their search, they succeeded early on April 20, 1770, when lookout Zachary Hicks shouted "land ho!" The east coast of the great south land, previously referred to on maps only as "a place where there be dragons", was about to become a part of the new world. Mapping as they sailed north along the coastline from what is now the state of Victoria, and not knowing how much farther they would have to sail to make port fall in Batavia, before the final run back to England, Cook was getting desperate to resupply the ship, when they finally found a promising looking opening in the cliffs on April 28th, and turned the Endeavour into a bay of "exceptional size", to drop anchor and replenish supplies. The ship's scientific officer, Joseph Banks, on seeing the abundance of life, suggested naming the area Botany Bay for he was astounded and delighted with the huge variety of wondrous flora and fauna observed. His scientific party, including his friend and colleague Dr Carl Solander, had plenty of new species to catalogue. But getting supplies was not as easy as was first assumed by Cook and his crew, from their initial observations of the native inhabitants. When they tried to come ashore, they were confronted by members of the local clan. Recommencing the journey north on May 6th, Cook noted in his log on May 15th that "a tolerably high point of land bore N.W. by W., 3 miles distant; this point I have named Cape Byron. It may be known by a remarkable sharp peaked mountain lying inland N.W. by W. from it. Inland is pretty high, but near the coast it is low". Banks documented in his journal on the same date that "at sunset a remarkable peaked hill was in sight, five or six leagues off in the country, and all about it was well wooded and looked beautiful as well as fertile". Thus, just 3 weeks into the European mapping of the east coast of New Holland from the deep south to the far north, the remnant plug of the biggest shield volcano in the southern hemisphere, was recorded into written history. 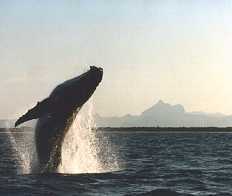 Photo: Humpbak whale and “Remarkable sharp peaked mountain” courtesy of Paul Waters and Lance Hansen, Murwillumbah, NSW.